Traditional shmups have always been easy to learn, yet difficult to master. Most players can pick up the controller and figure out how to play in a minute or two, however, the level design is normally much more punishing than in other genres. New players can easily be intimidated by the huge difficulty spikes that these titles normally present, especially when getting a game over can sometimes mean starting over from stage one. Rigid Force Alpha might be one of the best options for new players, as it’s lower difficulty selections provide ample opportunities to learn the game’s mechanics before taking on a more challenging run. There isn’t too much innovation in the gameplay department, however, there doesn’t really need to be. Moving the ship feels extremely precise and took no time at all to get used to. The ship’s weight feels completely natural to any fan of the genre and should be easy for newcomers to pick up as well. Powerups can be collected that alter the ship in a variety of ways, such as changing its shot type or adding some additional satellite ships to provide additional fire. The satellite ships can also block enemy fire, which makes them absolutely necessary late in the game. Their positioning can also be influenced by the press of a button, so players can adjust for a variety of defensive and offensive situations. The game’s most interesting mechanic involves a meter at the bottom of the screen that builds up whenever the player collects the green dust left behind by defeated enemies. This meter can be used for either a powerful super shot that deals extra damage or a close range defensive move that blocks projectiles in case of an emergency. 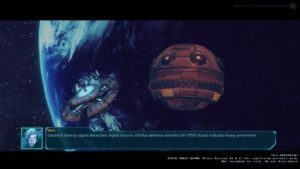 The player’s ship can also become a magnet that absorbs all surrounding green dust, however, this does cause the ship to move much more slowly while the button is being held down. 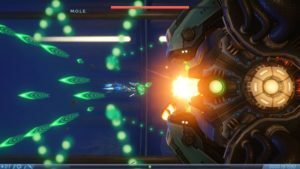 Other than that, Rigid Force Alpha plays like a traditional horizontally scrolling shmup, with six stages to complete and a boss at the end of each stage. This is an awesome thing, however, because trimming the fat has clearly allowed the developers to focus on the things that matter in a shooter. Each stage feels and looks completely unique, with detailed backgrounds accompanying each new level. The enemies also do a great job of fitting in with the theme of each stage. For example, the stage taking place inside of a cavern is filled with spiders and worms as opposed to the robotic enemies seen in some of the other stages. The bosses are also one of the game’s highlights. Each one is surprisingly creative in terms of design, which is refreshing to see in a genre that tends to rely on giants robots as the majority of their battles. The first two are relatively simple, but things change relatively quickly in terms of difficulty. During the latter half of the game, the boss battles will demand a combination of pattern memorization and quick reflexes. This may seem daunting at first, but the patterns never felt unfair on the Medium difficulty setting, so most players will likely find them an enjoyable challenge. Speaking of difficulty settings, Rigid Force Alpha includes an easy mode for beginners that allows them to start the game from any stage they’d like (after they’ve made it to the stage at least once, of course). Usually, shmups will have players restart the entire game if they hit a game over, and while that is how the other difficulty levels work, easy mode is there for those that don’t want that kind of pressure. It’s a great way for players to learn the ins and outs of each stage, preparing them for a full run on medium or hard mode. Some of the landscapes in the game looking stunning on the right monitor. Besides the regular hour long campaign, there is a level select mode and a boss rush mode. These modes are perfect for practicing the skills necessary to achieve a high score on a standard run, especially when it comes to some of the more challenging boss patterns. Rigid Force Alpha’s sound design is also a treat. Every stage in the game is accompanied by a fantastic track that fits the theme of the stage perfectly, with some of them being catchy enough to cause an earworm. Voice acting is also included in each of the game’s short cutscenes, which is nice to see. Additions like this, round out the package and make the game feel even more polished. While the experience is relatively short, it’s still an easy recommendation for both new and experienced players. The difficulty options do a fantastic job of adapting the game to any skill level, making it easy for anyone to start practicing and improving within the first few play sessions. Experienced players will be pleased by the fact that this is still a pure shmup experience that does away with most of the fluff, focusing on gameplay over all else. The tight controls and enjoyable level design make it difficult to put down, even after the first few playthroughs. Summary : Classic shoot’em up action in modern 3D! Blast off to take down hordes of infected aliens and dreadful machines programmed on waging an intergalactic war against mankind!